Right on the nail: why don’t we learn?? Thank you so very, very much for sharing this Dear DR. Rex!!!! This is/was so personal to me. I can imagine. I feel it now & I’m not even close! It was all like a bad dream, but you did not wake up. I don’t know Donna, I think at times like this it is so important to recognize how far we have come even while admitting we still have much further to go. When we see a city burning it is all to easy to focus on the bleak in the situation. The only “Earthly” thing we can do at a time like this is to look into our own hearts and examine if we are personally part of the solution or part of the problem. The frustration being exhibited in Ferguson must absolutely be felt internally when reflecting on those circumstances. Those who feel no need to understand will be found to be ignorant. I guarantee that ignorance can be the only thing at the root of this turmoil. Education and compassion is the only sure fix and it will not be a quick fix. Any claims of immediate solutions that do not include a healthy element of LOVE should be rejected out of hand. Seeing it up close, living in the shadow of it, makes you feel like somehow you should be able to do something. 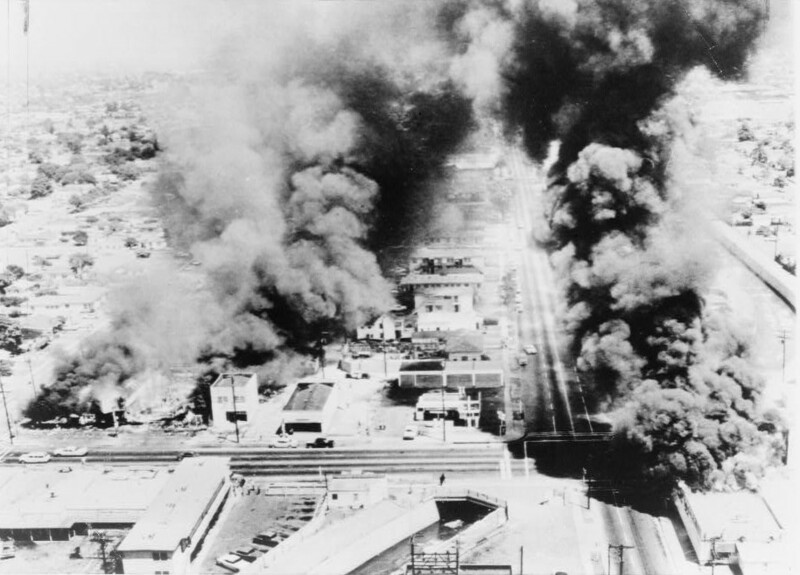 But, in LA, after the different Riots, it was all still the same and nothing did really change. These Riots, this Hatred, hurts me personally because all of my life I have had so many friends of every race and every color. Racism is such an ugly word and here we are all these years later and what have we learned, or done about it? A girlfriend of mine drives a truck from NC to CA every week, she called me from CA where the place erupted because of the Rodney King thing. She didn’t know why the place went crazy. I have a feeling that racism will be with us until people stop seeing color and begin seeing humanity. It is heartbreaking for me to think we have made no progress at all. It has been nearly 50 years since Watts, how little has changed. And the sad thing is, all it takes is a little unrest and a lot of people will cry out for the authorities to clamp down more in the name of safety. It’s scary sometimes how close we are to a police state. just looking for trouble is so sad. This seems to happen every time, this is no way to heal anything. Ugh, outside instigators? That is sad indeed.